After a six-month hiatus, so Archie could implement their new Archie Horror imprint, Chilling Adventures of Sabrina is back with issue two and it's gloriously creepy and wicked. How could it not be when you're telling the story of someone named Madam Satan. Her devilish backstory leads up to Sabrina in her current place with some terrifying details along the way. It's another spectacular horror series that can comfortably sit alongside Archie's other winner, Afterlife with Archie, and on your pull list. It's no surprise that both horror titles are great because they share the same writer, Roberto Aguirre-Sacasa. He's a born storyteller with a great understanding of suspense. His prose captures the feelings and intentions of the characters perfectly even a dangerous witch like Madam Satan. Reading the exposition is a lot like listening to scary stories told while at camp or a sleepover. You're bound to hang on every word, every new detail and suddenly you're enraptured with the tale. And Madam Satan's connections to Sabrina's parents are sad, unsettling and uncomfortable. Just the way you want a horror book to make you feel. A little blood and violence along the way doesn't hurt either. Robert Hack makes all this possible with a wonderful sketchy style that harkens back to the style of horror books of the past. His watercolors also add a great contrast to the backgrounds when things get bloody in the foreground. There's a certain glee in the design of Madam Satan's true face that chills to the bone no doubt but must be fun to draw. Her skin removed exposes a red face with wide eyes that would scare the pants off anyone. She's trouble of the worst kind and is headed directly into Sabrina's life. The great suspense series from Scott Snyder and Jock, Wytches, works on a psychological level whereas Sabrina is old fashioned, pee-in-you-pants, horror. I would argue Sabrina is better. Sabrina comics aren't just for kids anymore. 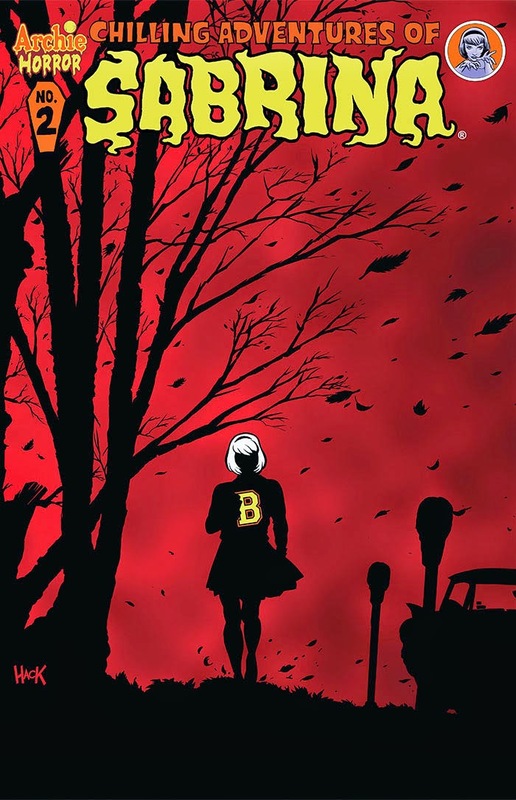 Chilling Adventures of Sabrina lives up to its name and makes it one of the best comic books in any genre.